November 2017 - New over-water dining room under construction. Mangrove Homestay is closed until June 1, 2019. 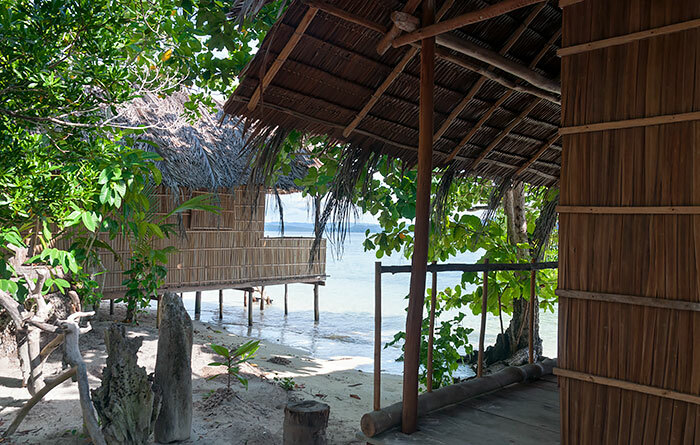 Located in a sheltered, northward facing cove near Yenbuba village on Mansuar, Mangrove Homestay has one private bungalow and two two-room bungalows. 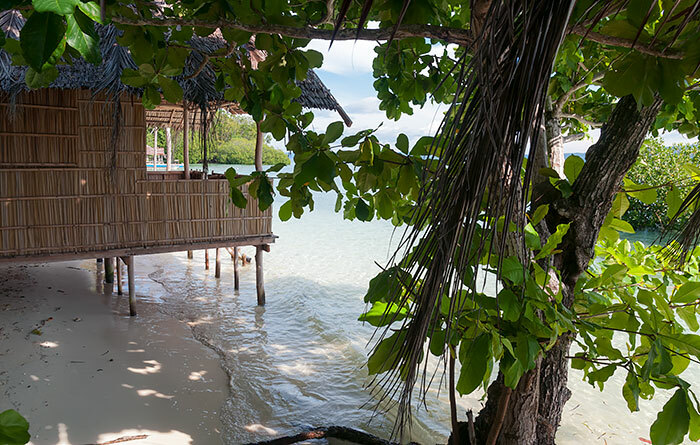 All are right on the beach, with verandahs that are over water at high tide. 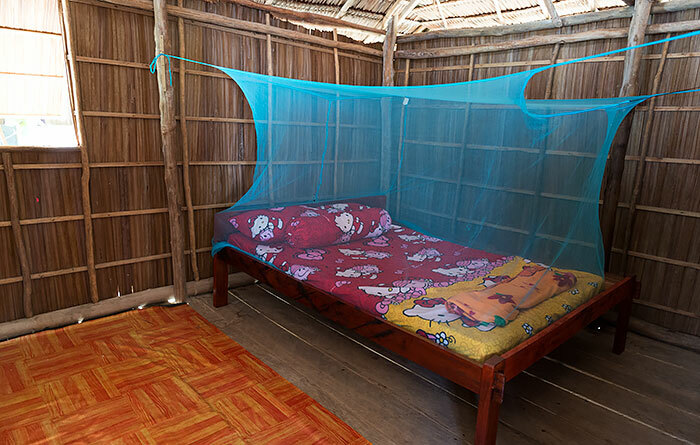 The bungalows have large bedrooms with real beds, sheets, pillows, bolsters and mosquito nets. Bedrooms are also equipped with a small table and have power outlets and a room light switch. A covered walkway from the rear of each bungalow gives access to the bedroom/s and the verandah. 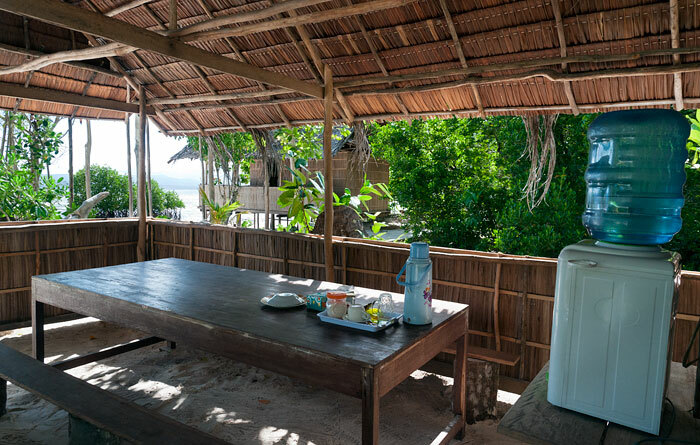 The verandahs are provided with a small table and two chairs and have great views across the strait to Gam and Waigeo. 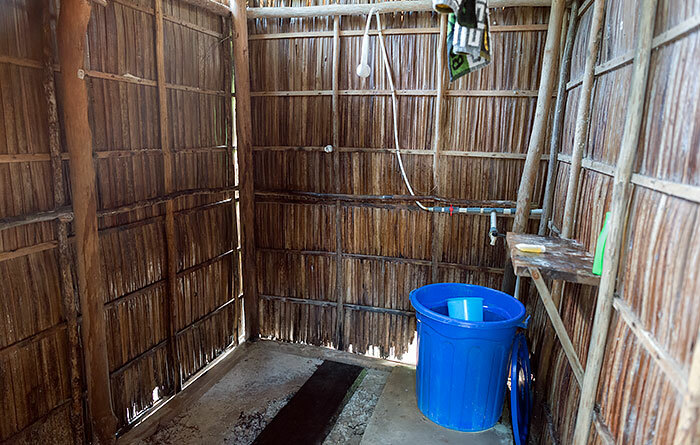 Mangrove Homestay’s bathroom and toilet facilities are in separate rooms in a building behind the bungalow. 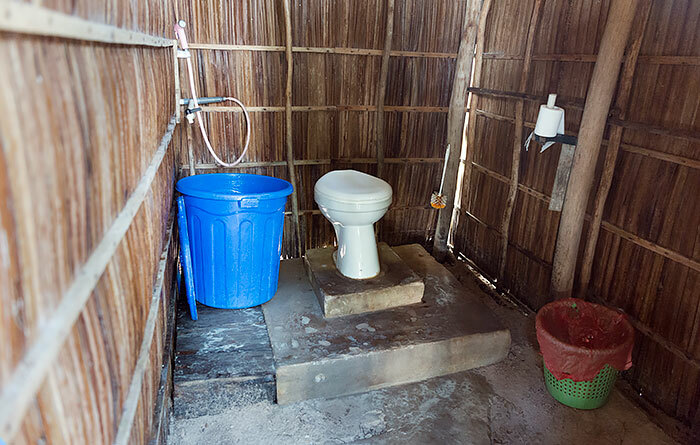 The toilet is western pedestal style, the bathroom is dip mandi. Both rooms are also equipped with handheld shower heads. 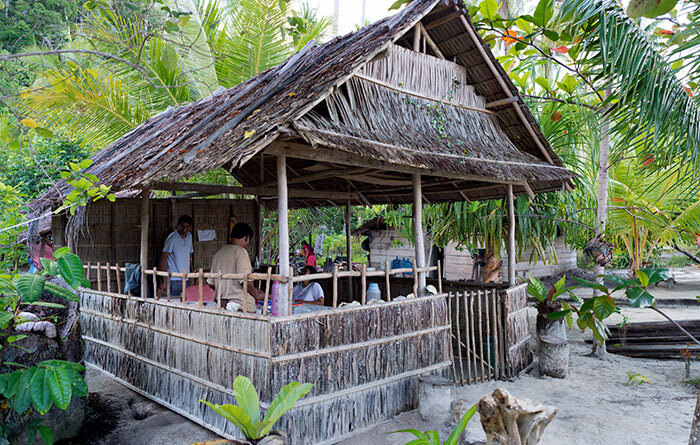 Meals are taken in a beachside dining shelter which also has great views of the strait between Mansuar and Gam. Tea, coffee and drinking water are always to hand there. 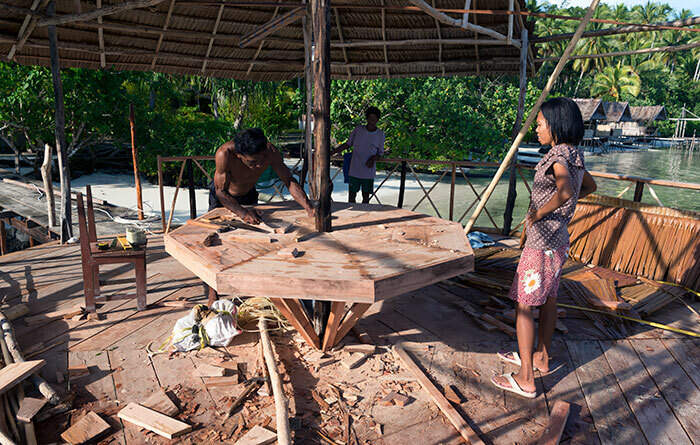 A new, hexagonal over-water dining room was under construction when we last visited in November 2017, as was a a private, over-water “honeymoon bungalow”. 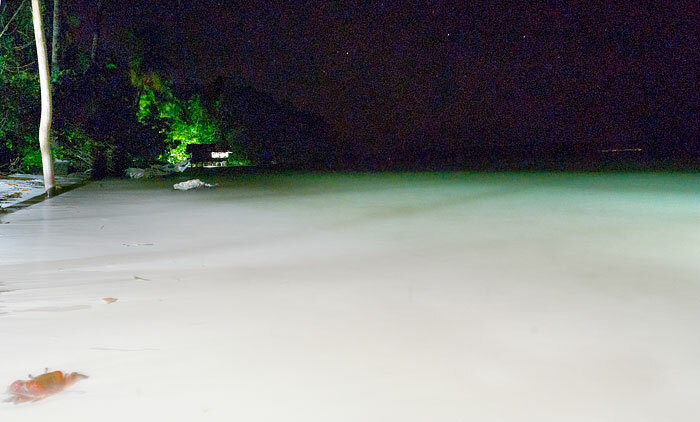 Electricity at Mangrove Homestay is supplied by generator and is available from sunset to around midnight. The village of Yenbuba is a short walk away along a well made path and basic supplies can be purchased there. 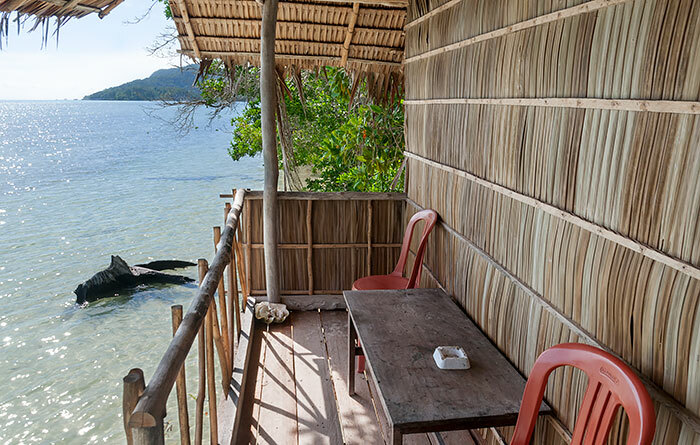 Only a little English is spoken at Mangrove Homestay. Transport between Waisai and Mangrove Homestay is by speedboat and costs IDR 600,000 each way. The price is per trip and is split between passengers. 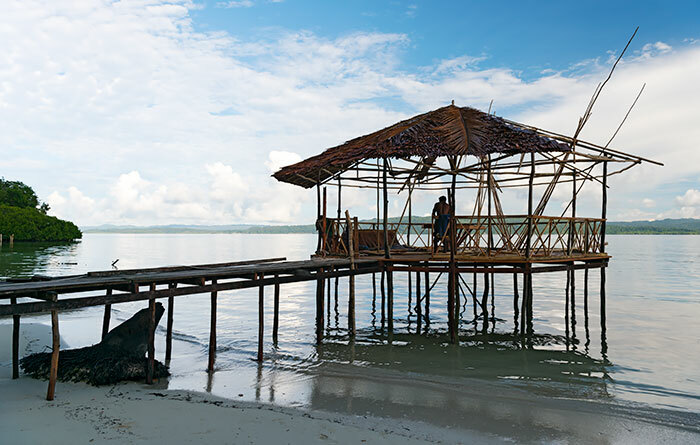 Mangrove Homestay is a good base for a range of activities, with excellent snorkelling available at the door and close by at Yenbuba Jetty. 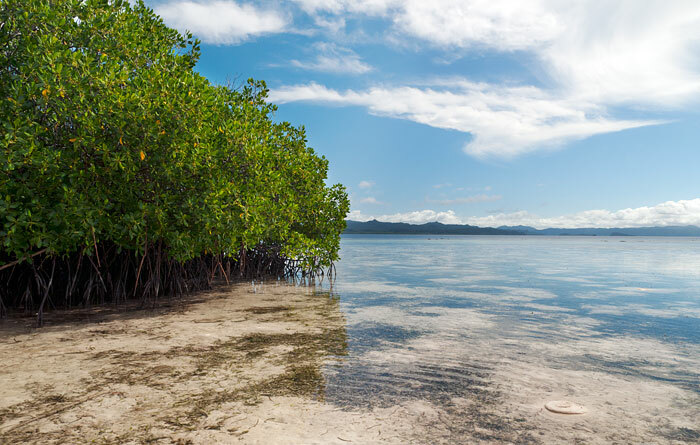 Mangrove doesn’t have snorkelling gear available, so make sure to bring some. There’s lots of hiking possibilities as a well made trail joins the homestay to the nearby village of Yenbuba and the more distant Yenbekwan to the west. From Yenbekwan it’s possible to continue along the north coast and then cross Mansuar past an inland lake to the south coast village of Sauwandarek. There’s great snorkelling at Sauwandarek too, but you might want to organise a boat ride back, rather than make the return trek! At low tide it’s possible to cross exposed sandbanks to the tiny island of Ransiwor that lies between Mansuar and Kri. There’s excellent snorkelling to be had around the southern shores of Ransiwor too, but be aware that currents there can be very strong once the tide starts running. The sandbanks themselves make for a fascinating exploration, as many young fish and other marine creatures are trapped in shallow pools by the retreating tide. Kri can be reached via the sandbanks at low tide as well, which opens up even more hiking possibilities. Be sure to time your walks carefully though, otherwise you’ll need to pay for a boat to get back to Mansuar. The jungle behind Mangrove Homestay is full of birdlife, as are the low tide shallows in front of the homestay. You’re guaranteed to see Walking Sharks sleeping amid the nearby mangroves during the day, as well as host of small fish and other marine creatures. 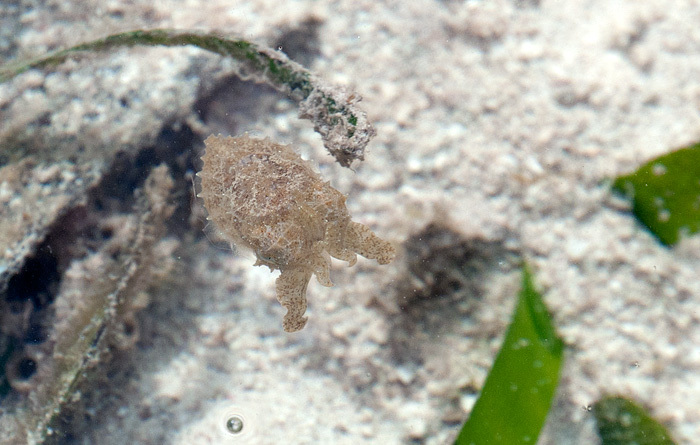 Do be careful walking in the shallows though: Try to always take the same (and shortest) path, as compaction of the sand destroys the homes of the myriad of creatures that live and breed in it. 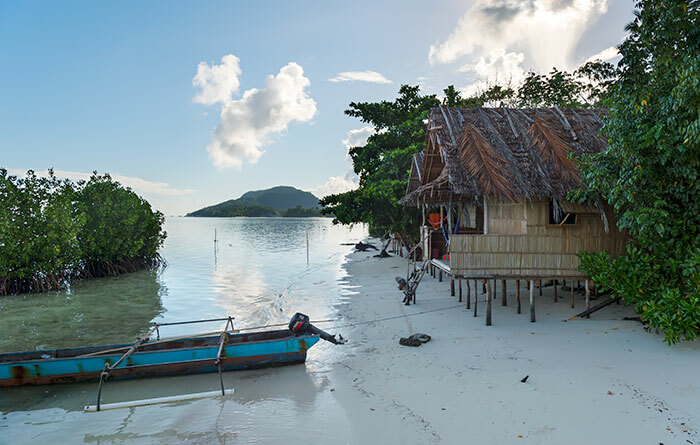 Mangrove Homestay can arrange boat tours by speedboat or longboat to any destination you wish to visit. 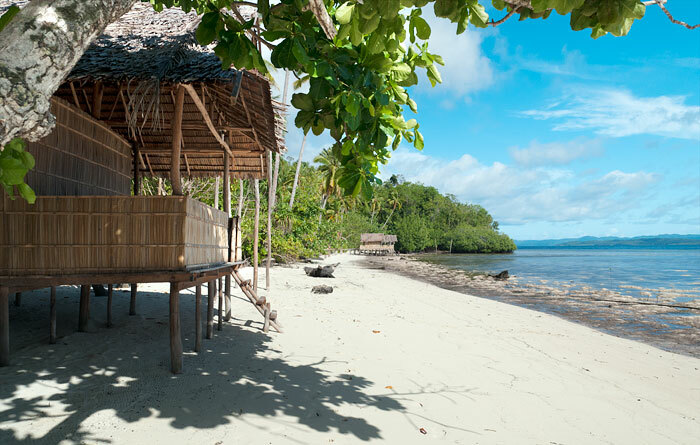 See our Mansuar Island page for an overview of the island and its attractions. Very disappointing, confirmed our booking with them in October 2018 for our February stay and reconfirmed in December. When we arrived there was the place was empty, no one there! Luckily enough the home-stay next door had a spare room- so we stayed there- they were fantastic. When I arrived back in Bali I discovered an email sent the day before our arrival asking if we were coming, Considering we were staying on another island in Raja with no access to email this was obviously pointless- not impressed. 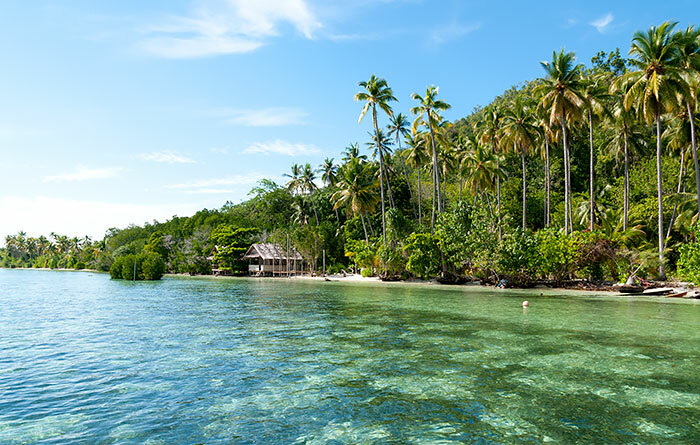 BTW: If the “still coming” email you refer to is the one sent by Stay Raja Ampat’s booking system, it was sent to you 8 days before your check-in date. We stayed at mangrove in August 2018 and had one of the most memorable experiences of our lives. Kristian could not have been a more accommodating, helpful person. 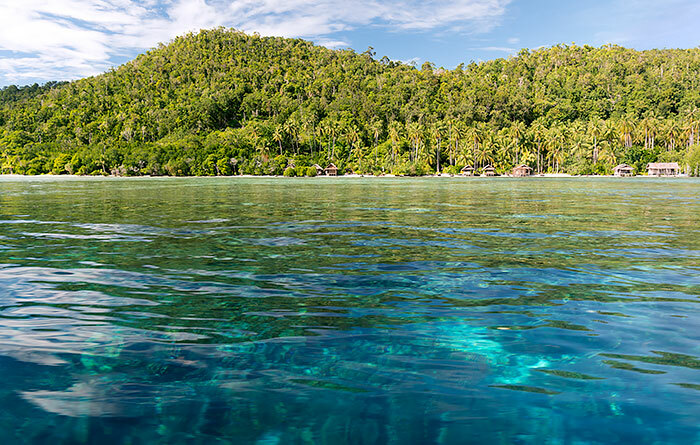 The setting was as stunning as we expected Indonesian Melanesia to be, and the extraordinarily diverse marine life was so abundant and immediately visible it was visually and emotionally overwhelming. It felt like being in the middle of an episode of the BBC Blue Planet series. The nearby Yenbuba jetty (10 minutes walk) has some of the best snorkeling and diving in the area, and Christian showed us some of his favourite secluded local spots, including a small patch of reef close by where you can find mandarin fish. 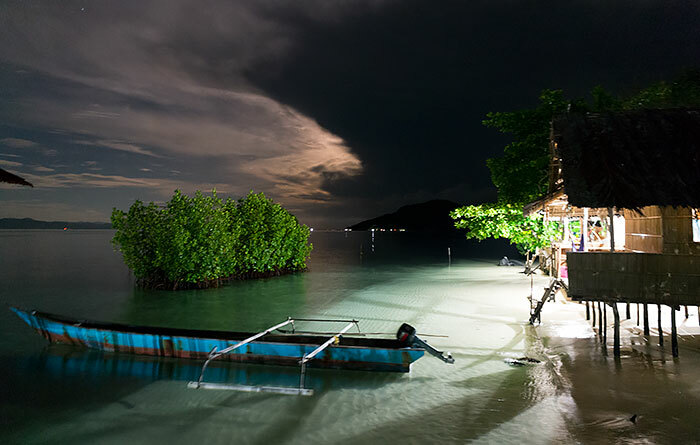 The food was good (fresh tuna nearly every night), and the location is perfect if you are looking to be as close to the region’s world-famous reefs as possible. The one downside was that I’m tall, and the bed wasn’t really made for someone my size, so I didn’t get a good night’s sleep the entire time, but it was a small price to pay. A beautiful, life-changing experience. Thanks again Kristian (and brothers). Completely agree with Ana’s review below. 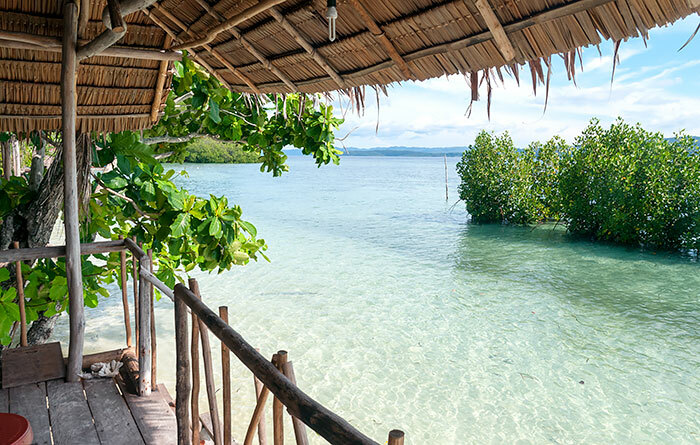 We booked for three nights in April 2018 but ended up only staying one and moving to nearby Lumba Lumba (a short boat ride), because snorkeling was our priority and the House reef was way too far out and impossible to get to except at max high tide. When I asked the manager where to snorkel, he told me not to go to the House reef but to Yenbuba village. The coral was indeed nice there, but I wanted a snorkel-in-front-of-my-bungalow place, not a walk-for-15-minutes place. The area is quiet from other travelers. – Great homestay for those who want time for themselves. We were the only guests during our stay and really enjoyed the quietness. – The location is great if you don’t want to be surrounded by another 4 homestays and 50 backpackers up and down the beach (as happens in West Kri). 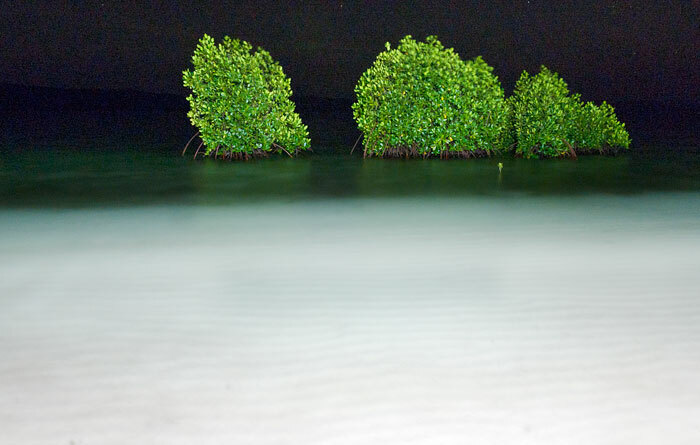 Mangrove is within walking distance to a very interesting village and jetty from where the snorkeling is fantastic. – Rooms are very basic. The private bungalow has a larger room, but the mattress sits on the floor (as opposed to what’s shown in pictures from the others bungalows). Also, the shower hose and head (pics) are no longer there. – the food was abundant and tasty, but pretty spicy and oily too. We only had fish in 2 out of 7 meals. The rest were eggs (plus vegetables and rice, which were always there). – the snorkeling is good but hard to get to the wall during low tide. Also, the wall is very steep there,so there’s only a narrow strip where you can see. This place is ok, but the rooms are quite small and basic compared with others. Also the food was the worst we had. There is a fan in the room, but it’s not much use as the electricity will go off at midnight and you will wake up as a result! 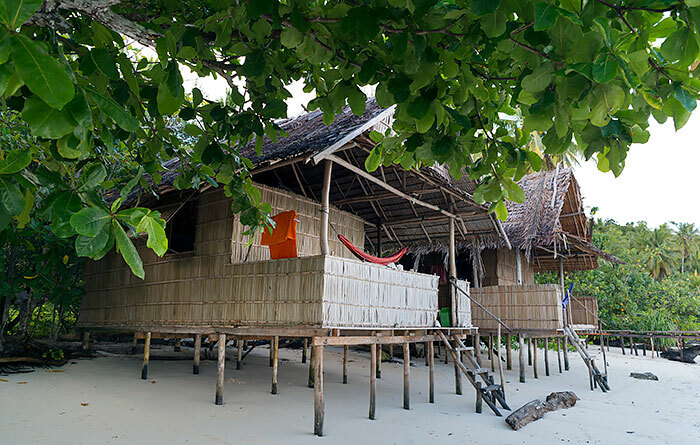 The location is good, close to GREAT snorkelling at Yenbuba jetty, but the adjacent Koryau Kayem looked to have better rooms. Me and four friends visited Mangrove Homestay in January 2018, and we had great fun! It is a nice and calm area with good snorkeling spots and a village nearby. They offer nice trips to reasonable prices, and the staff are all very kind (especially John!). A very beautiful homestay in a very beautiful location. We stayed in the over-the-water “honeymoon suite” which was huge and can comfortably accomodate 4 people. From this room, you can directly jump into the ocean and snorkel. It has a huge verandah and you can put mattresses on it and enjoy unobstructed views of the nearby islands. The room has a lot of windows so there was always a fresh ocean breeze. 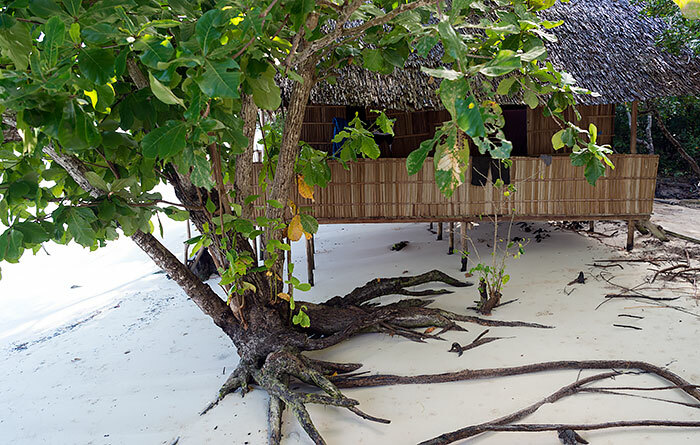 The other rooms of the homestay are directly on the beach and during high tide are also over the water. Very nice rooms all in all! The dining area is also over the water and is very nice. Food was tasty and plentiful. There’s a strong mobile data signal for those who need it. Location is very nice. The reef directly in front of the homestay is very good for snorkelling. 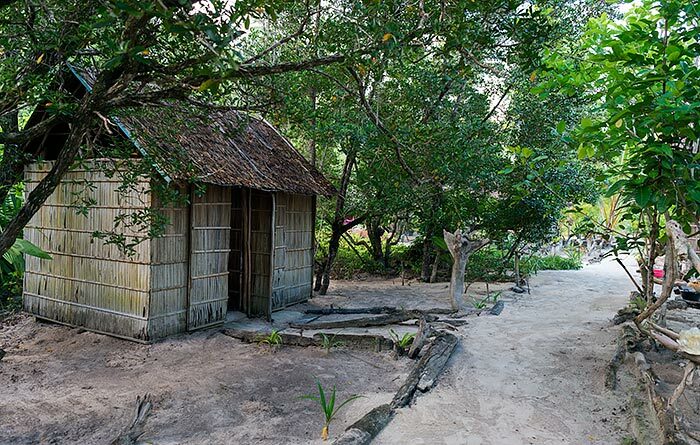 It’s also a 10-minute walk on a beautiful beach to the village where one can get basic supplies. The jetty is also nearby for even more excellent snorkelling. Wisye and Heka are very nice hosts. Communication was seamless and easy. Highly recommended place for unwinding and relaxation and we will definitely stay here again when we come back to Raja Ampat. As our vacation comes to an end and our life has to start back again, it gave me time to think and there is a time to say a BIG THANK YOU! Me and my family truly enjoyed our amazing holiday in your Mangrove Homestay. You made our stay a wonderful experience. We felt like at home, because our mum always takes care of us, as same as you did. Every time when I saw you, you all had a smile on your face and you brought us some really tasty homemade cookies or some sweets. We had an amazing opportunity to get to know local people, taste amazing indonesian cuisine, snorkeling in clear ocean and see impressive life in the ocean. The virgin nature and untouched reef really amazed us. I can not remember a vacation that was so relaxing, but full of adventure at the same time. Every day I go through all pictures again and again. Your place left in our mind and our heart a stunning memories. So thank you one more time for everything you did to ensure we had the best stay. Really liked this place as I did use it as a base station for nearly 2 weeks. It is allot different than what the photos stated which turned out a nice surprise; there is now a beautiful circular eating area over the water, with complementary tea and coffee therein. The bungalows are cozy with a nice change of not having to sleep on the floor. The food is really good considering the distance from most towns and general access to supplies. Snorkeling infront of the bungalows is alright but a small walk to jump off the jetty in the neighbouring village is well worth it. The only real inconvenience is not having an easy access to boats during low tide, but this is common. PS. Really liked the driftwood art lining the path, makes it feel like a keen sense of detail is put into the place. 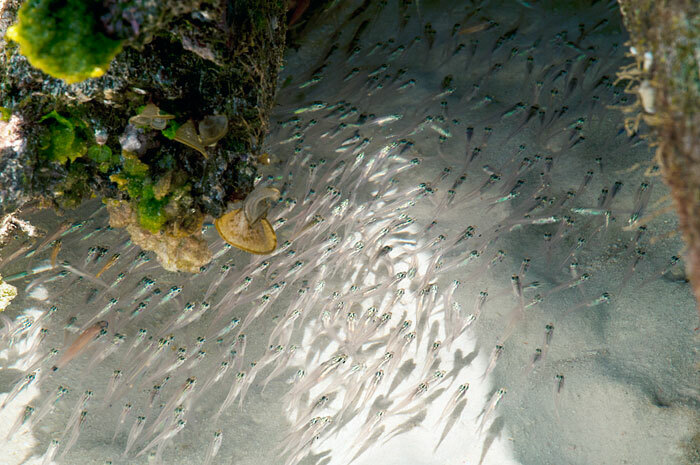 With only a short walk to the village Yenbuba, you can meet the locals and go snorkelling from the jetty seeing all the fishes. 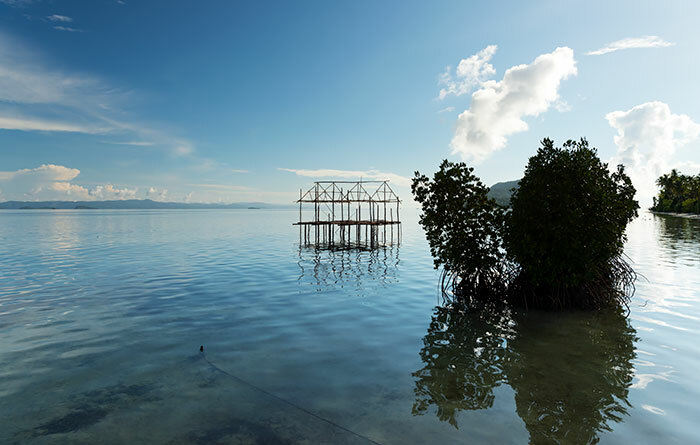 It is great to stay at Mangrove homestay because it is so close to the reef and is within walking distance to the village and you are free to wander and explore. Raja Ampat is such a wonderful place, definitely will come to this paradise again! My wife and me stayed in Mangrove Homestay for a few weeks and we can highly recommend this lovely place. 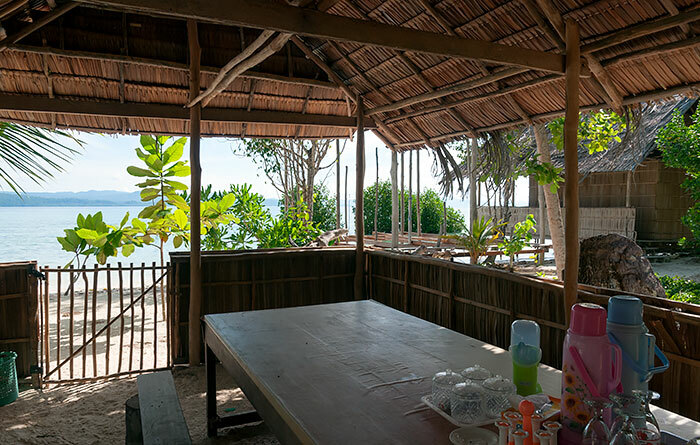 We have visited Mangrove Homestay few times before and we are always coming back because it is conveniently located, walking distance from beautiful diving/snorkelling spots around Yenbuba village on Mansuar Island and close to Kri Island. Food was excellent, very friendly owners Ibu Wisye and Pak Heka with Mama Koba who looked after us with care. Rooms and surrounding areas are very clean, no rats no mosquitos and stunning view of surrounding islands. Nice cosy rooms with beds and fans, good Internet, definitely Five Stars and we will be back. Highly recommended. We stayed in this lovely homestay on a few occasions last year and in September 2017 as well. Transport from Waisai harbour to this homestay is very scenic, takes about 45 minutes. 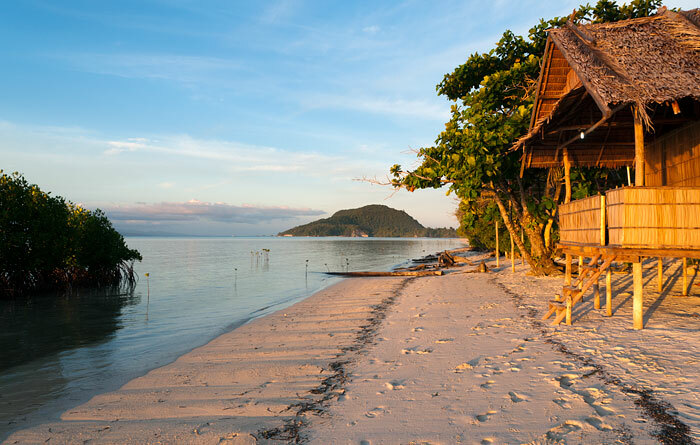 We always return to this little paradise, because the hosts Wisye and Heka are very friendly people, the place has great vibes, good food, excellent location, which proves to be very convenient and is about 10 minutes walk along the beautiful beach to Yenbuba village on Mansuar Island. One can walk/wade (during the low tide), snorkel or swim across the shallow waters and sandy bar to Kri Island which can be sometime crowded. So if you are after a tranquil oasis in a paradise, this is the place to be. 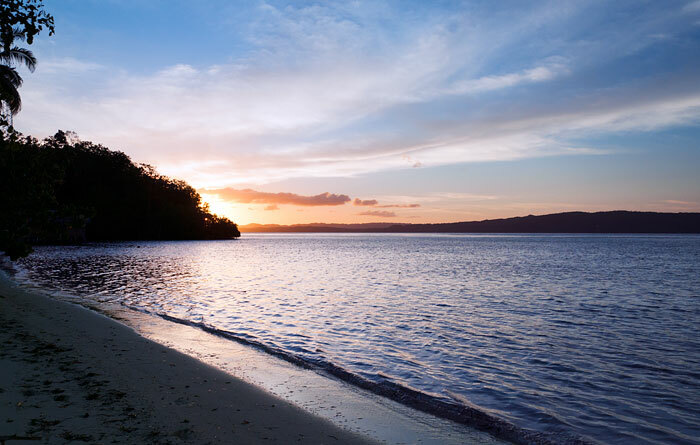 Beautiful sunsets, stunning panoramic views over Gam and Waigeo Islands, great home reef for snorkelling/diving, lush jungle at the backdrop, lots of parrots, lorikeets and hornbills flying above, walking tracks and best views from the Mansuar Island over the straight. Diving can be organized with operators on nearby Kri Island. Highly recommended Homestay and getaway in paradise. Good on you Wisye and Heka. I had a really great stay here. It was quiet and relaxing. No other tourists when I was there so I had a more ‘local’ experience which was a nice change. Wisye & Heka and the Mamma are so lovely, always happy and make you feel Welcome. We had lots of laughing. They keep the homestay looking lovely and clean and well cared for. The food is plentiful, you won’t go hungry here. The snorkelling is excellent straight out from the bungalows. There were turtles and many fish and good healthy coral. Great homestay, friendly owner (Freddy) and family. Served great tastefull meals. Location of the over water bungalow was super! 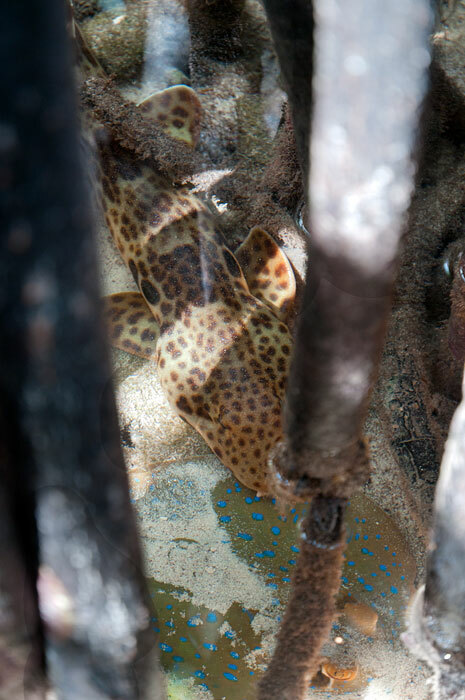 Next to a small mangrove bush with loads of fish including the walking shark. The house coral was good, but a short distance walk is the village with jetty with amazing coral and fish. Because the homestay is somewhat far from the village it’s peacefull and quiet. There is electricity and a nice basic toilet and mandi. The surrounding islands feature the birds of paradise and the couscous. You can snorkle or dive. Freddy is planning to upgrade the homestay in the near future. 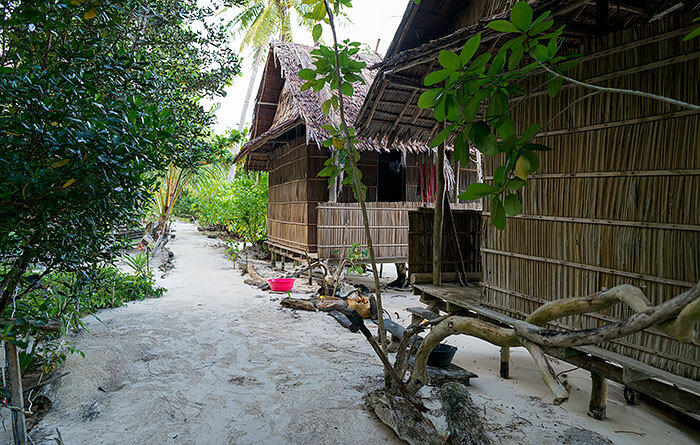 During our two week-stay in Raja ampat we spent four or five nights at this lovely place in Mangrove homestay. the food: fried bananas, fish, fish every day. And it was amazing! Even though the fish was a little dry at times the meals were still good (even though not as good as at other stays), always on time and served friendly. The Place: at high tide you can jump into the sea right from the balcony – awesome! swimming: great area for snorkeling and a huge drop off just around the corner. surrounding: At low tide you can walk to other islands which is great during the day. Also there is a village in walking distance. 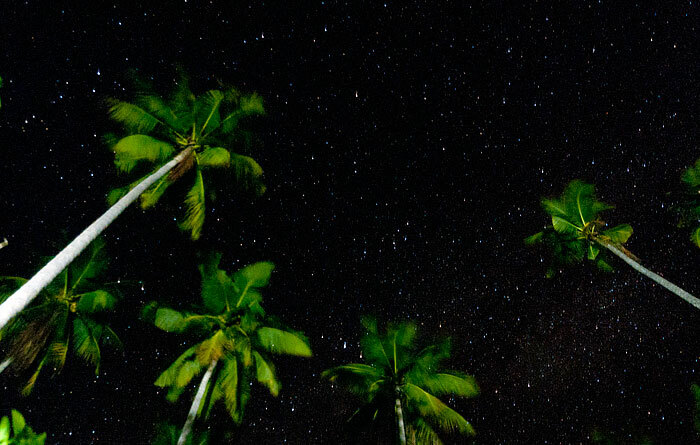 In october/ november 2015 we spent 15 nights in Raja Ampat. At 11 of the 15 nights we were the only guests. Weather was fine – it used to rain once a day but mostly at night and only for short times, so this didn´t matter or even was a welcome refreshing. Communication in advance by SMS and e-mail was not easy but it worked. Given the prices partially called for boat transports – as incredible as impudent – I recommend to arrange boat transports in advance and negotiating with the one you (maybe!) are heading to gives you a better position. We stayed at 3 homestays: Mangrove/Mansuar, Beser Bay/Gam and Yenros/Gam and I can recommend all the three accommodations. But as there are differences, I can not rate them all equally with 5 stars. Mangrove Mansuar: Bungalow over the water (at high tide); very good coral and drop-off all along the coastline; pupils one their way to school passing by every day; a short path along the beach leads to the village facing Kri; spectacular landscape between Mansuar and Kri, especially at low tide; telephone signal is good enough even for internet. Hello. Can you tell is which homestay you liked the best! For your information we only stay 7 nights and like to stay at one place. We only are going snorkeling, not diving . And did you do the snorkeling package! I liked best Beser Bay Homestay on Southern Gam. 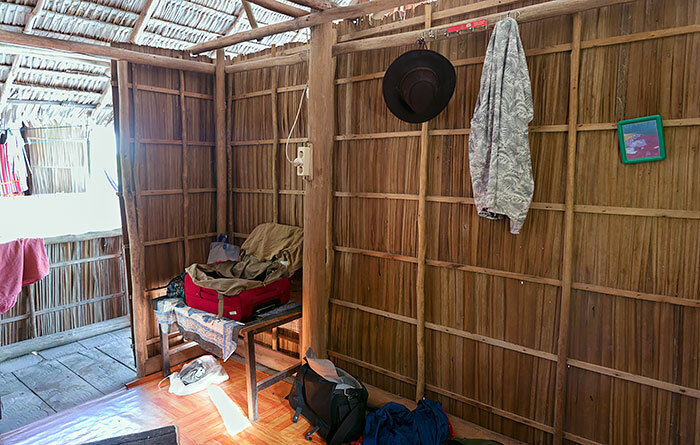 For reasons I don´t understand, the homestay is suspended from the stay-raja-ampat-site, but you might find contact by facebook or a google-search. We hope that Beser Bay will be back on the site soon. The reasons for homestay suspensions are explained here. 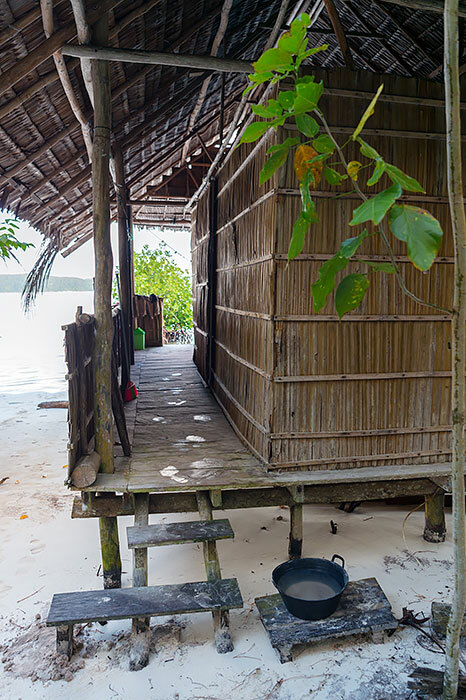 NOTE: We’ve noticed that the folks at Mangrove Homestay seem to have made a maths error when calculating the price of their 7 night snorkelling package. We’ve contacted them about this and will hopefully have a clarification soon. In the meantime, you’d be better off just booking accommodation and paying for snorkelling trips separately.